FORT LAUDERDALE, Fla. – When Charles Kelly studies the offense that Jim Harbaugh has built at Michigan, he sees a balanced, pro-style attack that can operate out of a myriad of different formations. He also sees the legacy of Harbaugh’s father, Jack, in almost every play. Kelly first crossed paths with Jack Harbaugh in the late 1990s and early 2000s, when Kelly was an assistant at Jacksonville State and Harbaugh the head coach at Western Kentucky. As the patriarch of one of football’s most famous families with more than 50 years spent as either a player or coach, Harbaugh left a lasting impression. 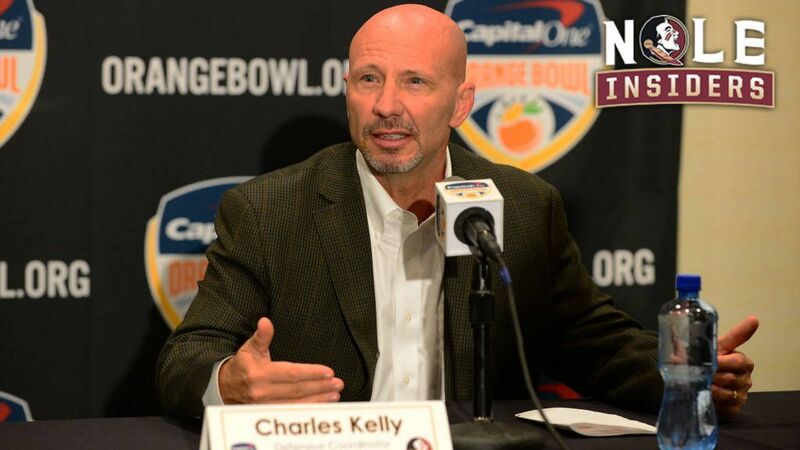 Perhaps Kelly and the Seminoles can glean a bit of an advantage from that familiarity when they face the Wolverines in the Capital One Orange Bowl on Friday. Kelly expects a test either way. While Michigan’s second-ranked defense garners most of the attention, the Wolverines quietly sport a potent offense that’s can do damage in a variety of ways. In Jim Harbaugh’s second year at the helm, Michigan is averaging more than 40 points per game – ahead of College Football Playoff participants Alabama and Clemson – and has achieved near-perfect balance: The Wolverines this season have racked up 2,679 rushing yards and 2,593 passing yards. Florida State, however, should field one of the better defenses that Michigan has played this season. The Wolverines have faced six teams that rank in the top 25 in total defense, including No. 4 Ohio State and No. 7 Wisconsin. But they’ve also lined up across from 112th-ranked Hawaii, 95th-ranked Rutgers and 74th-ranked Maryland. Thanks to a startling midseason turnaround, Florida State has climbed to No. 29 in the total defense rankings (up from 94th after five games) and is allowing an average of 357.2 yards per game and 5.45 yards per play. That’s pretty good company, and fairly remarkable, given the way this season began. After five games, Kelly’s group found itself in unfamiliar and uncomfortable territory, when, in the face of injuries and matchups against some of college football’s top offenses, the Seminoles started out 3-2. FSU allowed an average of 41.75 points per game to its first four FBS opponents and, along the way, endured a 63-20 loss at Louisville and a 37-35 defeat at home to North Carolina. Making matters worse were season-ending injuries to starting safeties Derwin James and Nate Andrews, which pushed a wave of less-experienced players into action. Safe to say, then, that early October wasn’t always a fun time to be Florida State’s defensive coordinator. But, despite facing criticism that seemed to grow louder by the week, Kelly refused to fold. “It’s easy to say this, but it is true: You have to control the things you can control, and you can’t worry about the things you can’t control,” Kelly said, echoing one of head coach Jimbo Fisher’s favorite sayings. On Oct. 8, the Seminoles took their 3-2 record to Miami for a game that, one way or another, figured to be a turning point for the season. And it was. FSU allowed just 19 points in a 20-19 victory that sparked a 6-1 finish to the season. Although the defense had a few missteps in that game, it also produced the play that might have saved the season, when senior defensive end DeMarcus Walker blocked an extra-point attempt that would have tied the game late in the fourth quarter. Sophomore cornerback Tarvarus McFadden also had an interception in the end zone that kept the Seminoles in striking distance when Miami threatened to open a big lead. With a 17-6 win over Wake Forest the next week, it appeared that the decision had been made. Led by a blistering pass rush, FSU allowed more than 20 points just once in its last seven games. And in their final three games of the regular season, the Seminoles gave up just three offensive touchdowns. With their second-half renaissance all but complete, the Seminoles can say they have a defense worthy of their predecessors. Although that slow start still has FSU in the middle of the pack in some major team categories, the Seminoles can still lay claim to the nation’s highest sack total (47), as well as the country’s leading pass-rusher (Walker, with 15 sacks in 12 games) and interceptor (Tarvarus McFadden, eight in 12 games). Their reward, aside from their own personal satisfaction, is a date with the Wolverines in the Orange Bowl. And one more chance to show a national audience that the way a team starts speaks far less to its character than the way it finishes.